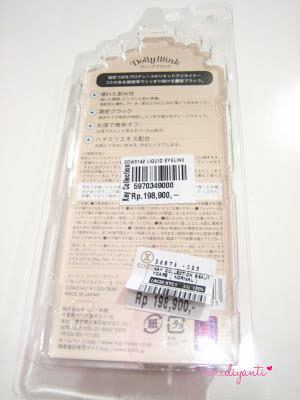 Dolly Wink is one of Japanese makeup brand that popular among beauty bloggers and also famous for its liquid eyeliner in most of beauty blogs in this world! Many beauty blogs make a review about this liquid eyeliner and it makes me crazy! 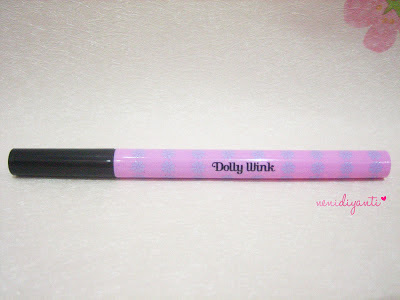 I decided to buy it several months ago due to many good reviews about Dolly Wink liquid eyeliner. 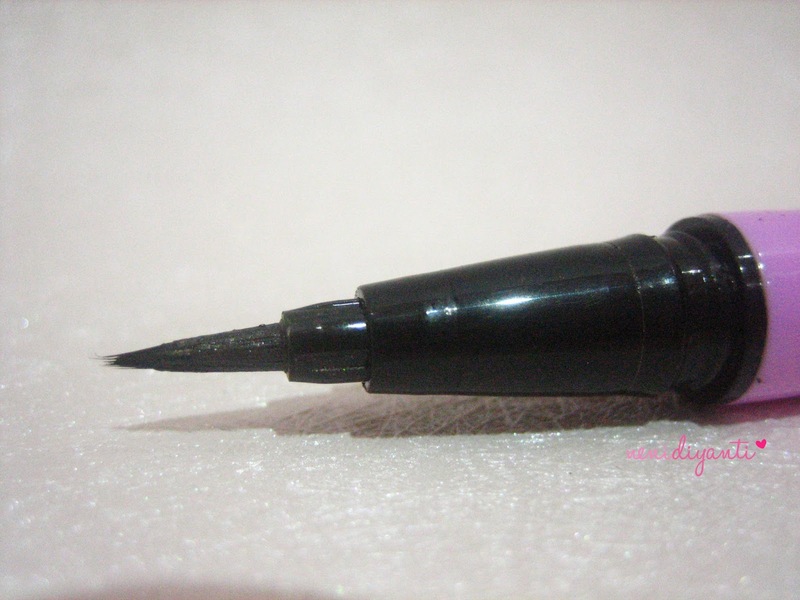 Dolly Wink liquid eyeliner comes in two colours, black and brown. I prefer to have the black one and still on progress to get the brown one. I'll get another one because this eyeliner is really really good on me. 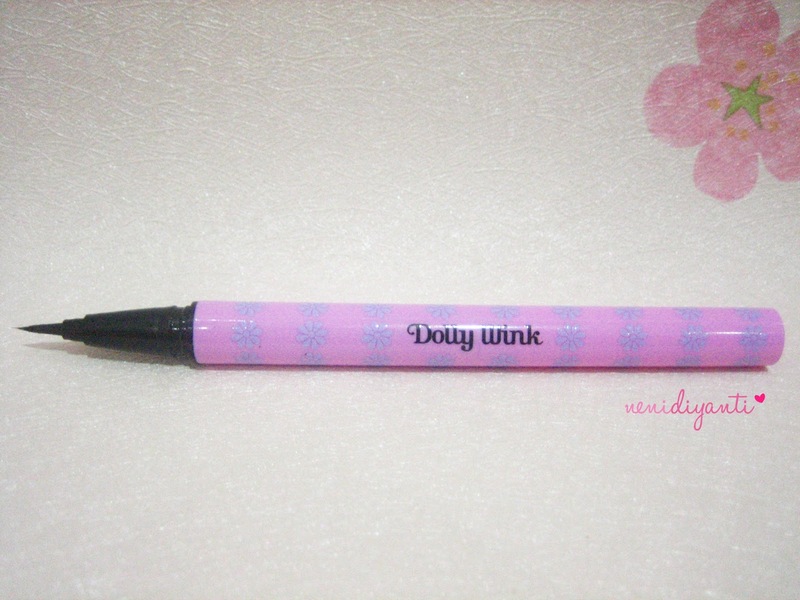 FYI, this is the newest version of Dolly Wink Liquid eyeliner and its design is really improve. It comes in a sweet pink pen with black cap and flower print all around the pen. 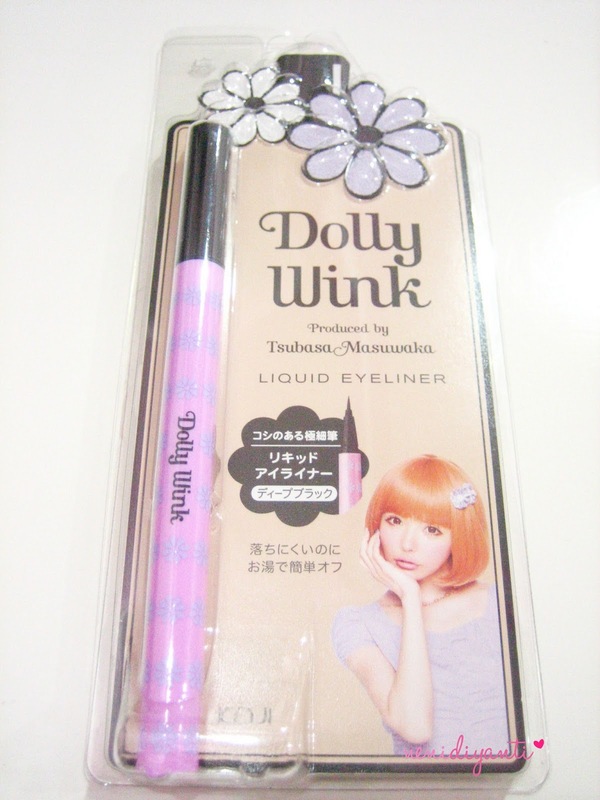 In Indonesia, you can get any Dolly Wink products easily at KAI Collection. It comes in pen shape with precision brush. The brush is really precision and you can easily draw even a thin line on your eyelid. Let's see the swatch. I drew a thin line, thick line and also my name. I make the thin line with only one swipe and I swipe several times to get thicker and darker line. 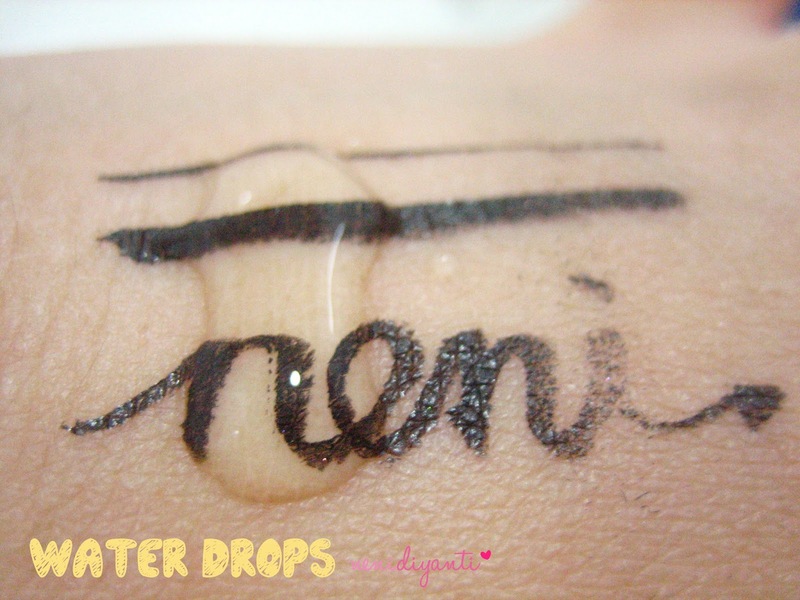 This eyeliner is quick to dry (testing on my eyelid), so I don't need to wait for a long time to blinking after applying eyeliner. Its staying power is also good. After I draw a line, I only wait for a moment and rub it. It doesn't fade away easily. I need to rub it with more power to get it faded. 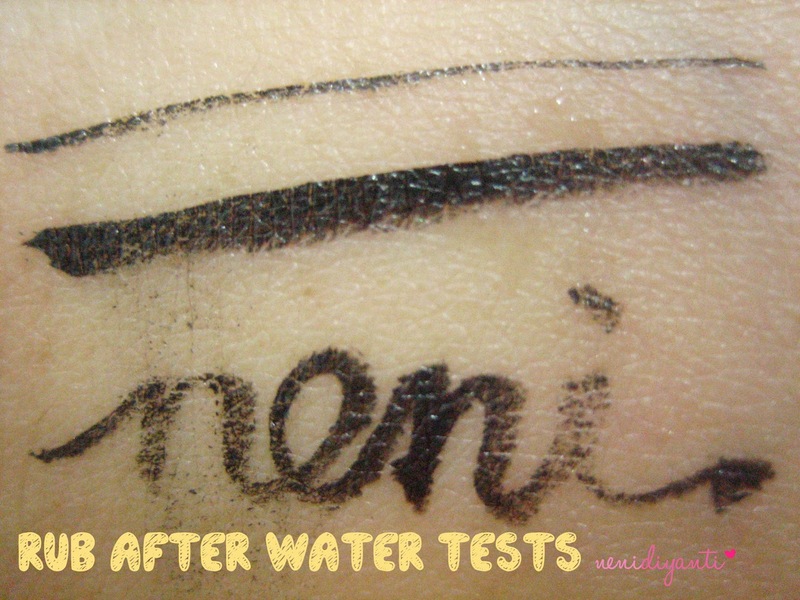 Okay, water tests. For those who have oily eyelid, you may want an eyeliner which sweat resistant and (maybe) also water resistant. Am I right? 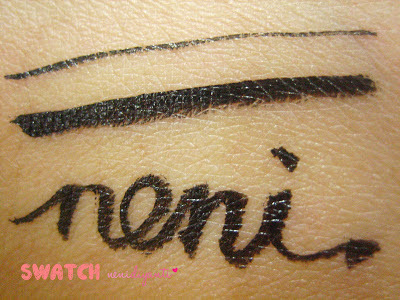 Then, this eyeliner could be your choice. Though I don't have oily eyelid, but I have many activities under the sun ; outdoor. And when I put eyeliner on my eyelid, I want it to stay there for a long long time. And I hope it wouldn't fade away easily because of sweating. I want it to still stay until I got home so I no need to touch up in the middle of the day. And Dolly Wink liquid eyeliner granted my wishes. 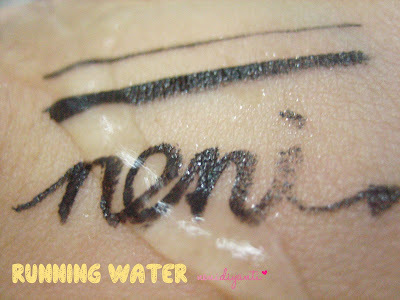 As you can see on the picture, it doesn't fade away by water. It still stay there even under running water (tap water)! Some people said, Dolly Wink doesn't suit for them, but this one is really my favourite. 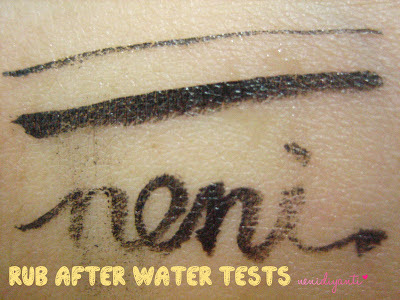 After being tested with water, I tried to rub it with medium power and as you can see, the eyeliner is gonna fade. Well, after all, don't think this is such a pricey product, let's say this is a good investment for your makeup case. It has cute packaging and good staying power, though it isn't water resistant, but it still stay even I got sweating during the day.